Filipino Fighter Eugene Toquero faces the former One Flyweight Champion Adriano Moraes on March 18, 2016 at Thuwanna Indoor Stadium, Yangon, Myanmar. Eugene Toquero is a 32 years old fighter from Manila Philippines, he has a record of 8 wins with 2 losses. Toquero won his 8 fights via KO and 1 by decision. Toquero is very known in the Philippines, he is a charismatic fighter with a good ground striking skills. Toquero is coming off a TKO win against Li Wei Bin last December 2015 in Manila. Toquero loses only to a fellow Filipino fighter Geje Eustaquio and to a Japanese fighter Riku Shibuya last year. 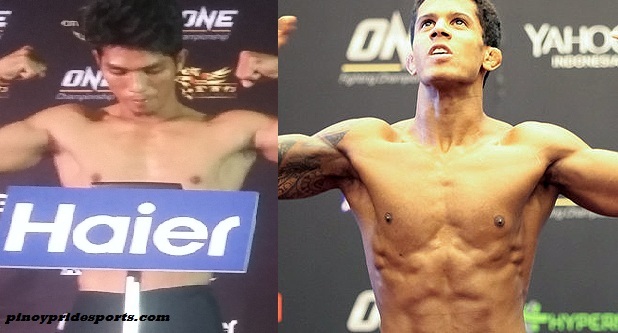 On the other hand, Adriano Moraes is a 26 years old fighter from Brazil. He was the former ONE Flyweight Champion. He got his belt when he fought Geje Eustaquio of the Philippines in September 2014. He successfully defended his title against Asuka Mikami in in March of 2015 before being nailed by Kairat Akhmetov via Split Decision in November of 2015. Moraes still has a good record of 13 wins with 2 losses. This fight is included in ONE Championship: Union of Warriors where Mohamed Ali faces Aung La N Sang in th Main Event.